When the telephone rang on the afternoon of November 11, I knew who was calling. I had been alerted a few days earlier that something quite special was about to happen. The caller was Neil Portnow, the president and CEO of The Recording Academy in Los Angeles, informing me that Maud Powell (1867-1920) had been chosen by The Recording Academy to receive a 2014 GRAMMY Special Merit Award for Lifetime Achievement. 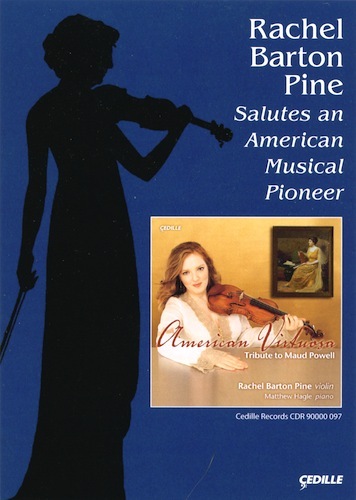 Back in July, I had sat in a sparely furnished bunkhouse with violinist Rachel Barton Pine at the Scottish Fiddling Camp at Valle Crucis, North Carolina, as she crafted the Maud Powell nomination to submit to the Academy. Since it can take any number of years for a nominee to be chosen, or it might never happen, we thought the chances were slight. However. There we were, a mere four months later, on the receiving end of this amazing news. Maud's peers in the recording profession had voted to honor this distinguished recording pioneer. She is the first woman instrumentalist to receive the Lifetime Achievement Award since the Grammy awards began in 1962, and only the fifth female classical artist. The other four were opera singers. Why Maud Powell? you might ask. It's a long story; an adventure of discovery that, at times, made me a detective and an explorer. Let's briefly turn back the calendar to my own childhood when I claimed that one day I would write a book. At the same time, I was drawn to music and tried playing various instruments: the piano, clarinet, and guitar. I enjoyed each of them, but it wasn't until I held a violin in my hands for the first time that I knew it was THE instrument for me. I did not take violin lessons until I was in my freshman year of college at American University in Washington, D.C. My decision came as a surprise to the school's music director because I was in the School of International Service, a study far removed from music. My choice was even more of a surprise to Neva Greenwood, the teacher to whom I was assigned. I have to admit that I was not much of a violinist and eventually gave up practicing (to the relief of anyone within earshot). However, Neva and I became good friends and it was she who introduced me to Maud Powell. Neva, born in 1905, had known about Maud as young musician growing up when Maud was still living. She recalled the great distress of her violin teacher when he learned of Maud's death in 1920. Powell remained an influence and inspiration for Neva throughout her life. There was something extraordinary about Maud Powell that ignited a flame within me. In a flash, I knew she would be the subject of the book I was born to write. After law school (the next step in my education), I embarked on a fascinating and exciting journey as I began to delve deeply into the life of Maud Powell and to write her biography. Maud Powell opened a vast world to me which I have been sharing with the rest of the world ever since, in the hope that people, young and old, might re-discover their musical heritage through Maud Powell and be inspired to follow her example. Maud came from a pioneering family: her father was a highly respected educator; her uncle John Wesley Powell was the first white man to explore the Grand Canyon and along with Maud's father was one of the founders of the National Geographic Society; her mother was a supporter of women's suffrage, a friend of Susan B. Anthony, and talented composer whose dreams were crushed by the conventions of the day. So, Maud Powell thought nothing of taking risks and of going where no one had dared to venture before -- particularly a woman. She faced many challenges and smashed many barriers in her life, but let's focus on what brought her the Lifetime Achievement Award. 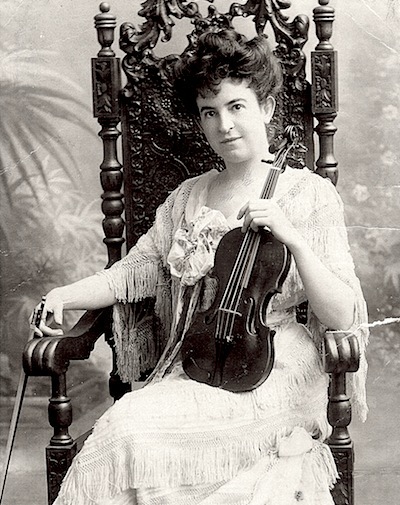 In 1904, Powell dared to face the challenges of the early acoustic recording process and helped launch the science and art of recording the violin. She became the first solo instrumentalist to record for the Victor Talking Machine Company's Celebrity Artist series (Red Seal label). Powell recognized the recording technology's potential to aid in her mission to bring the best in classical music to people everywhere. She recorded prolifically from 1904 until her untimely death at 52 in 1920, making more than 100 acoustic recordings. Powell mined the phonograph's potential to elevate the public's musical taste as she recorded only music which met the highest artistic standards. Through her recordings of short classical works and condensed versions of longer works, her artistry helped to revolutionize music appreciation. Even now, her playing, as captured by the primitive recording horn, sets the standard by which today's classical recording artists are measured. Powell pioneered the violin recital in America and championed music composed by women and by Americans alongside the music of Europeans. She premiered the Tchaikovsky and Sibelius violin concertos in America when other violinists balked at their difficulties. She was among the first white instrumentalists to integrate the works of composers of African descent into recitals and recordings. Once I myself realized who Maud Powell was and her immense significance in America's musical life, I decided to found The Maud Powell Society in 1986 to restore Powell's remarkable legacy. To me, the Recording Academy's award is a confirmation that we are succeeding in fulfilling our purpose. I have devoted 36 years to writing Powell's biography (published 1988), Maud Powell: Pioneer American Violinist; to reissuing her recordings (1989 on our own label and reissued again between 2001 and 2004 on the Naxos label, Maud Powell, The Complete Recordings, 1904-17, Vols. 1-4); putting together a collection of her transcriptions, Maud Powell Favorites, with Rachel Barton Pine as Music Advisor and Editor; and speaking throughout the United States. Rachel was as deeply thrilled as I was when we heard the news that Maud would receive the Lifetime Achievement Award. I like to think of Rachel as the Maud Powell of our time. She is a sterling artist whose vitality and versatility is phenomenal. She has performed innumerable concert tributes to Powell and claims her as one of her violin heroes, from whom she continually finds renewed inspiration. I am delighted that she and her husband Greg are members of the Maud Powell Society board, actively promoting Maud, working with me on various projects, and always providing encouragement and support. I find myself inspired by Rachel to continue my work on Maud. Just listening to her CD, American Virtuosa, Tribute to Maud Powell, lifts my spirits as I write the second edition of Maud's biography, necessitated by much new information. Why is The Recording Academy honoring Maud Powell? They recognize that this indomitable pioneer was one of the most powerful forces for the advancement of music in America. 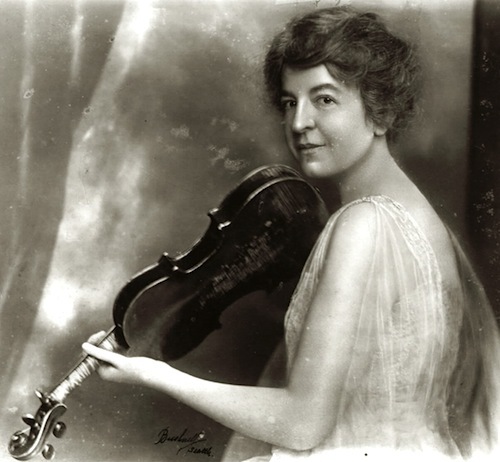 I encourage you to explore the Maud Powell Society's web site, where you will find much about her life and art and many articles written by Powell herself, with sound advice for young violinists even today. Her Ten Practice Rules will hold any violinist in good stead. You will find her recordings are a revelation -- not a relic! And I urge you to refresh your repertoire and programming with music from Maud Powell Favorites -- more surprises are in store for you! Visit us at www.maudpowell.org . In the meantime, Rachel and I are heading for Los Angeles to accept Maud Powell's award at the Special Merit Award Ceremony on January 25th.